Visual art and music duo NADA collaborates with new media artist Brandon Tay to pay homage to the Malay-language films of the 1950s and 1960s. NADA will conjure the sounds of Malay and Southeast Asian music from the 1960s to the 1980s against a visual backdrop created by Brandon Tay using the films highlighted in State of Motion 2018. Developed by Rizman Putra and Safuan Johari, NADA is a visual arts/sound project that explores the myth and synthetic history of a fabricated group of the same name, focusing on the excavation of the golden era of Malay/Southeast Asian traditional and popular music that spanned from the 1960s to the 1980s. 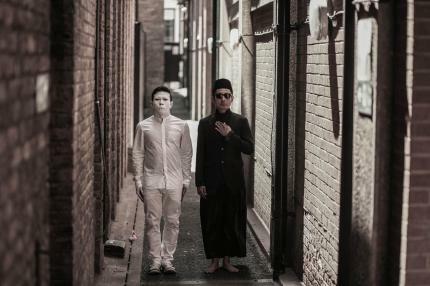 Fiction and reality are blurred as the duo deconstructs popular Malay songs from the past and melds them back together. Having performed internationally, NADA has also made appearances in local productions, most recently in Club Malam, an immersive performance for the Singapore International Festival of Arts 2016. Brandon Tay is a new media artist working with the moving image in the fields of projection mapping, audiovisual performance, and mediated sculpture. His work has been shown in the National Museum Singapore, the Singapore Art Museum and the Diesel Denim Gallery-Aoyama Japan. As an audiovisual performer- He has worked with musical artists Skrillex, Flying Lotus, and toured at the Worldwide Festival Sete, The Brainfeeder sessions Los Angeles, and InsideOut Singapore in London, New York, Beijing and Singapore.